Differential Manchester is similar with Manchester coding, which uses a simple Binary sequence encoding to prevent losing in pulse synchronization and low bit shifting improperly. This coding can separate pulse and data to analyze conveniently. 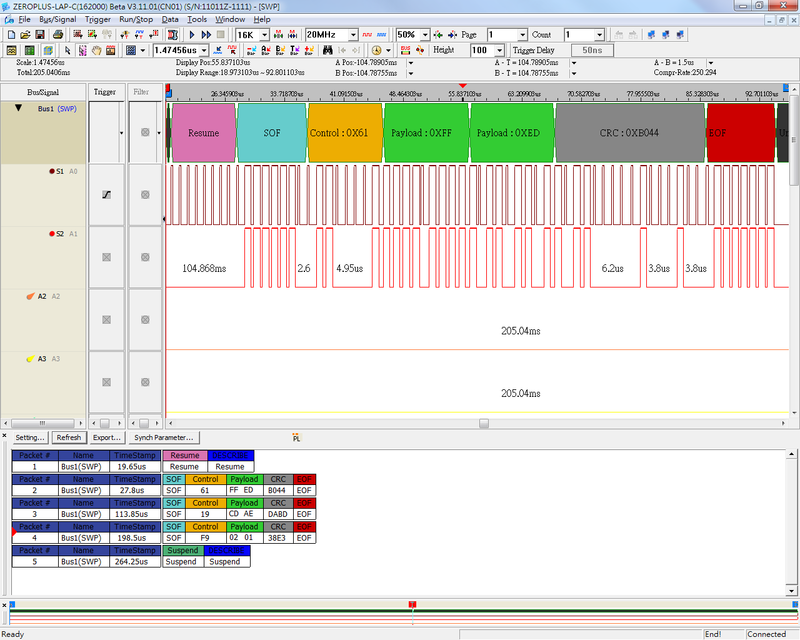 Zeroplus Logic Analyzer supports the function of analyzing DigRF Bus .The transmitted I/Q signals between Base Band and Radio Band adopt the analogy mode to transmit signals in the traditional RF communication; but the DigRF uses the digital transmission mode to replace the analogy mode so that it can reduce the risk of design and making, and the quantity of wafer pins to dwindle the volume of products. The ISO7816 UART is one kind of Decoding Module which is suitable for the International Organization for Standardization (ISO) 7816. The Transmission Mode of Smart Card is defined by the ISO7816. Users can analyze the signal when doing the Research & Development for relative products by using the ISO7816 UART Decoding Module of Zeroplus Technology. KeeLoq Code Hopping is a technology of signal encoding and decoding. A 64bits security code in the encoding will make sure the signal data can’t be cracked during the transmission. The KeeLoq encoder will send 66 bits data to the decoder, 16 bits data of that is a unpredictable code-hopping data. It can be applied to the HCS Series chip of Microchip. 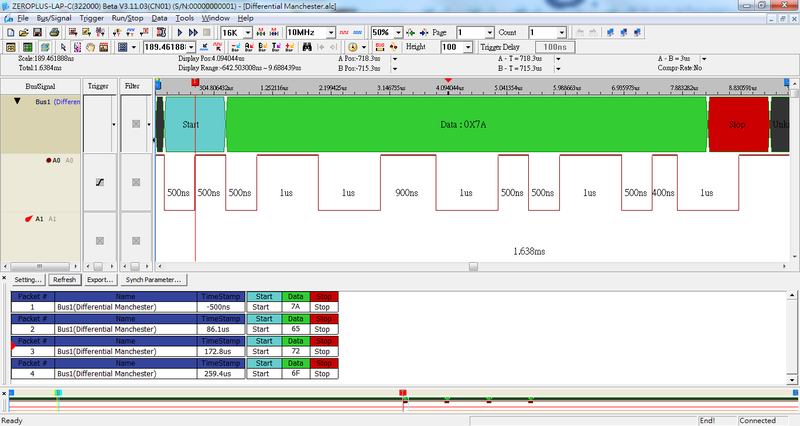 Manchester Encoding is used in Ethernet Medium System. Furthermore, it always is used in Electron Synthesis System, Transformer Coupling and Small Power CDMA. 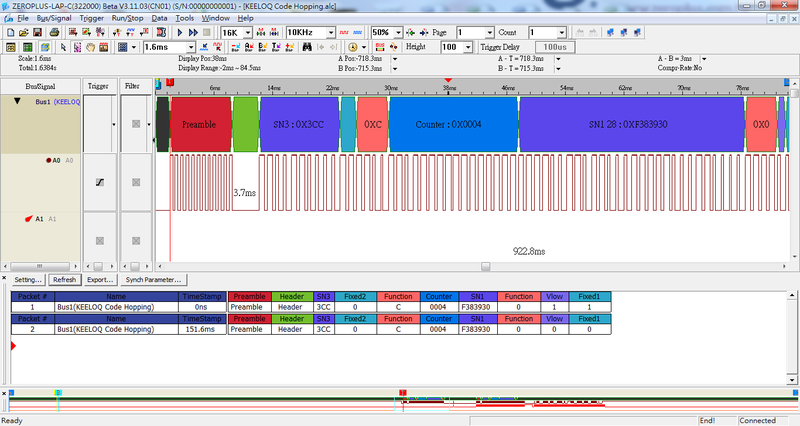 Zeroplus Logic Analyzer supports the Protocol Analyzer MII. MII is the interface between the Physical layer(PHY) and the MAC layer, which is issued through the publiced IEEE802.3U of the Ethernet Technology Specifications in 1995. It can support the the external device to store the internal PHY Register, and the internal PHY Register also can detect and control the status of the PHY device. With the development of the technology, the transmission of the Digital Signals is glutted with our daily life; and these signals also need the corresponding tool to develop, which will make enginners complete the development smoothly. By using the Zeroplus Logic Analyzer and the Auto Decoding Software of Bus, it will help you short the time of development, improve the effeciency of product development and save the cost. Meanwhile, the transmitted data in the signal will be displayed by the software automatically, and there is no necessary to calculate by manual. Certainly, you can provide the relative information to us, we will help you design the customized Protocol Analyzer Software. As the engineers analyze the signal data and only rely on counting the waveform to make signal decoding and find the problems,to rather consume time . But SGN6210RF module is supplied by SIGNIA, adopting theSIGNIA6210 specification,owning the more stronger and quicker data transmisstion ability than the traditional SPI signal . The MILLER is mostly used in the Passive Inductor Device.In general, engineers use the oscillograph to analyze and measure the Miller signals, but the universal Audio Analyzer doesn’t support the function of analyzing the MILLER signals;When engineers analyzed the data of signal , it will take so much time and power, if they only rely on counting the waveform to do signal decoding to find the problems during the time of analysis signal data. MIL-STD-1553, published by the United States Department of Defense, is a wireless military communication standard. It is mainly designed for the military and the aviation system, such as Radar, HUD (Head-up Display) and Weapon System. The Transmission Data on the MIL-STD-1553 Bus consists of three types, Command word, Data word and Status word. In addition, it belongs to the Master-to-Slave Network Transmission, which uses the Manchester Code to decode the data. The MODIFIED MILLER is one kind of Protocol Analyzer which is applied in the RFID System; it only uses one channel to transmit the signal; its signal structure is similar to the MILLER. According to the Protocol Analyzer MODIFIED MILLER Analysis Module, the complex packet of the Protocol Analyzer can be displayed on the window of the software with the graphical mode; it can improve the efficiency of Special Project Development for engineers. SWP (Single Wire Protocol) is a Bus signal that is used in the RF system and uses Manchester Coding. It uses the single wire mode transmission and supports two-way data communication. It can be applied to SIM card in phone and NFC (Near Field Communication) and its standard communication specifications is also defined in the ETSI (European Telecommunications Standards Institute). WIEGAND, constituted by SIA （Security Industry Association）, is a kind of Communication Interface of Contactless IC Card Reader. The protocol defines some common control applications，encryption or other specifications of the industrial application fields. And the manufacturers can standardize the interface of the Card Reader according to the protocol. WWV, WWVH and WWVB are a kind of Specifications, which are instituted by the NIST (National Institute of Standards and Technology). They are used to transmit the Standard Time through RF (Radio Frequency) Technique. The Radio Stations, WWV and WWVB, are located near Fort Collins, Colorado and the Radio Station, WWVH, is located near the island of Kauai in Hawaii. The electronic products are more accurate through this kind of Time Calibration Signals, such as the Radio Controlled Clock and the Electronic Clock. Copyright ZEROPLUS TECHNOLOGY CO., LTD.